Why, you may ask, would someone who’s recently completed a painful divorce want to read a book on improving your marriage? If I ever remarry, I will purchase a copy of this book. As it is, for my own growth, I think it’s good to look back and figure out the ways my own immature responses hurt our marriage. It can only help me grow. And that’s what this book is about: Behaving like a grown-up, an emotionally mature person in your marriage. I read the book because I was extremely impressed with the author’s earlier book, ScreamFree Parenting. So even though I’m not married any more, I very much wanted to read what he had to say about marriage. His mantra is in the subtitle: “Calm Down, Grow Up, Get Closer.” As the author talks about different scenarios in marriage, you can see what good advice that is. When Hal Runkel talks about calming down and keeping your cool, he’s not referring to hiding your emotions from your partner. Indeed, that’s one of the ways he describes that some people scream. “In ScreamFree Marriage, ‘keeping your cool’ does not refer to simple anger-management techniques or artificial rules of engagement (fighting fair). No, becoming ScreamFree in your marriage refers to something far more optimistic. Here, keeping your cool means discovering and holding on to your truest self — and having the courage to openly pursue your truest desires — even in the midst of your greatest conflicts. It means willingly and calmly facing the natural fires of marital commitment, and actually growing up — and getting closer — through them. The author goes on to show you the beauty of his formula: “Calm Down, Grow Up, Get Closer.” I’ll just summarize the two sub-steps of each step. For “Calm Down,” you Pause Yourself (self-explanatory) and Go to the Balcony, mentally take yourself out of and above the moment, gain some perspective. “And the first step in getting closer is, naturally, quite revealing. It is quite risky. It is the move we so often avoid in all our relationships, especially our marriages, because it necessitates so much openness and vulnerability. And yet, do it we must if we are going to have a chance at getting what we want most. What are we talking about? We’re talking about doing or saying that one thing you’ve been so reluctant to do or say for fear of rejection, abuse, looking stupid, feeling weak, or simply not getting the response you’d hoped for. We’re talking about laying down your hand and showing your cards. Then, after you Show Your Cards, the final part is to “Champion Your Spouse.” This does not mean telling your spouse he’d better do what you want. “While getting closer is all about focusing on yourself and representing that self to your spouse, it is also about welcoming, and encouraging your spouse to do the same. “Now I know that sounds a little contrary to what I was saying earlier about not doing this in order to provoke a particular response from your spouse. That’s not what this is. Championing your spouse is working hard to communicate — not so much with words or actions but by your very calm presence — that you welcome, and even invite, any response at all. Even if that response is reactive screaming (non-abusive, of course). Even if that response is silence. Even if that response is confusion, frustration, or choosing to voice a concern right back at you. By championing your spouse, you are again communicating what you want most — that voluntary connection that makes both partners feel prized, valued, and stronger as individuals. In reality, you cannot have that connection without your spouse choosing to reveal himself, in some way, back to you. . . .
“I certainly understand the dynamic of one spouse trying to change the other, and the other trying to resist those efforts. In many ways, that dynamic is the exact pattern I’m calling people away from. I’m asking folks to stop focusing on their spouse and return their gaze to themselves. But that applies to both the spouse doing the attempted manipulation as well as the spouse trying to resist being changed. Stop focusing so much on what your spouse is trying to do to you, and start focusing on something much more fruitful: changing yourself. “What’s fascinating about the Popeye defense” [“I yam what I yam, and that’s all that I yam.” Your spouse should just accept you for who you are.] “is that when it’s used, it comes across as some healthy self-acceptance that everyone needs to adopt. ‘I can accept me for me — why can’t she?’ On the surface, in our pop-psychology-riddled society, this may have the appearance of wisdom. But dig deeper, and this attitude is not only unwise, it’s actually harmful to both you and your marriage. . . .
“Just think about that for a moment. You want your spouse to just accept you for who you are? Really? Even if you’re lazy? Even if you totally let your body go and become weak, fat, and unhealthy? Even if you drink too much or watch too much TV or read too many romance novels? Even if you neglect your kids, spend without discretion, complain about your spouse to your friends instead of addressing the issue directly? Your spouse is just supposed to sit back and accept all these behaviors as the honest, unchanging you he/she is stuck with forever? “If your answer is no, then Calm Down, Grow Up, and Get Closer by actually seeking out your spouse’s feedback. Go to him and ask what you could be doing better. Ask her directly how she thinks you’re doing, and what she wishes you would do more or and less of. Why? Because if you’re going to be the best spouse possible, then you need continual feedback on how you’re doing and how you can improve. “Now, if your answer is yes, that you believe your spouse should just accept you fully, warts and all, then I want you to listen carefully. Your problem is not your spouse’s efforts to change you. Your problem is that you don’t respect yourself — at all. You don’t even like yourself. Anyone who respects herself is going to actively work to improve herself, rarely sitting back and remaining satisfied. Anyone who even likes himself is going to nurture his God-given desire to grow in wisdom, and build on his skills and abilities. Instead, you’re just wallowing in atrophy, using your emotional muscles only to defend yourself against your spouse’s efforts to change you. And you’re wondering why even the good things in life just don’t seem to be as pleasurable as they once were. That’s because you’ve ‘accepted’ yourself and demanded that your spouse do the same. “But I know you. I know that you don’t want your spouse to just accept you. You want her to respect you. You want her to respect that you are not a child, incapable of doing anything for himself and in need of a mommy to tell him how to behave. You want him to see you as an adult, one who knows herself and knows what she needs to do. Well, there’s one way to gain that respect. See what I mean? There’s good stuff here! May it help many, many couples Calm Down, Grow Up, and Get Closer. After all, if your spouse doesn’t understand you, could there perhaps be something you can do about that? Boxer Books, 2008. 28 pages. I was very surprised to realize I hadn’t reviewed this book yet. It’s been a favorite Storytime choice of mine ever since I found it in the New Books section in 2008. It’s absolutely perfect for toddlers and young preschoolers. They are generally quite good at animal sounds, and this throws in a nice twist. “Little Rabbit sat in the farmer’s field. “‘Can you make other noises?’ asked Calf. “‘I like baa,’ said Little Rabbit. You can guess how the book goes from there. The two cute little animals Baa together and a lamb comes to investigate… and so on. At the end, all the animals declare their favorite sounds, and Little Rabbit makes a surprising choice that will provide a laugh. This is a happy book, with cute baby animals doing silly things and making the “wrong” sounds. Like I said, it’s a fantastic choice for Storytime, and would also be great for sharing with a little one who has mastered animal sounds and knows how the world works. They will especially enjoy the twist! Houghton Mifflin Harcourt, 2011. 442 pages. The Return of Captain John Emmett is a mystery set in England a few years after the Great War. Laurence Bartram has returned from the war. His wife died while he was in France, when she was giving birth to their firstborn son. He’s writing a book on old churches, but not making much progress. “I wanted to tell you that John died six months ago and, horribly, he shot himself. He seemed to have been luckier than many in the war, but when he came back from France he wouldn’t talk and just sat in his room or went for long walks at night. He said he couldn’t sleep. I don’t think he was writing or reading or any of the other things he used to enjoy. Sometimes he would get in furious rages, even with our mother. Finally he got in a fight with strangers and was arrested. Mary asks Laurence to investigate John’s death, to try to find out why he would do such a thing. His investigation is leisurely and slow, but one thing leads to another, and he begins to get a picture of John Emmett’s war and especially a firing squad where a British officer was executed, and John Emmett was required to be the commanding officer. Recently, quite a few other people who were there that same day have died or been killed. Is there a connection? Laurence’s well-connected friend Charles is reading golden-age detective fiction during the book, but this book didn’t really evoke those books. With the details about the war experiences, this isn’t really a “cozy” mystery, and the clues aren’t really in place for the reader to spot the denouement. However, this book was just perfect for the end of my stroke recovery time off. It told an interesting mystery at a leisurely pace, but really evoked the time period after the Great War and let you watch Laurence Bartram taking a new interest in life. With him, you got to know the many different characters who touched John Emmett’s life, and piece together the story of what happened. I should add that this book is a first novel, and is very impressive as such. I don’t know a whole lot about England between the wars, but the author clearly does, and fills the book with loving detail. Don’t pick up this book if you’re looking for an action-packed quick read! But if you’re looking for a leisurely and lingering story of people making sense of a difficult time when the world was changing — then this book is a good choice. HarperOne (HarperCollins), 2011. 202 pages. I first read that Love Wins was coming out when I was sitting at the Information Desk at the library, reading a publishing newsletter about upcoming titles. I couldn’t restrain myself: I burst out with a “Yes!” I had to explain to my bemused co-worker how happy I was that a mainstream evangelical writer was writing about Universalism. When I quietly believed myself that all will (eventually) be saved, that love wins in the end, well, those who found out seemed tolerant but a little sorry for me with my silly ideas. I knew that if Rob Bell wrote about it, it would come to the attention of many people whom I respect. I ordered the book right away. And of course I was coming from a position of whole-heartedly agreeing with him from the start. So I can’t really judge if this book is convincing for people who do believe that unbelievers will burn in hell with unending torment. Personally, I think this book was written more for people who are looking at Christianity from the outside — to tell them that the Christian faith is not as exclusive and judgmental as they may have thought. And I think it presents that message wonderfully. Christians who are considering these ideas, but don’t think they are Biblical, might have more of their questions answered reading Universalism, the Prevailing Doctrine of the Christian Church During Its First Five Hundred Years: With Authorities and Extracts, by John Wesley Hanson, or The Inescapable Love of God, by Thomas Talbott. However, I was right: my pastor actually mentioned this book in his sermon, when talking about acceptance. He had not read the book, but said a little bit about the controversy and that Rob Bell says that love will eventually win for every person. He said that he does not think Rob Bell is right, but I loved this comment he made: “Shouldn’t we all want him to be right?” Shouldn’t we want Love to win for every person? I loved that he said that, because one of the things that has come out of this belief for me is indeed a greater acceptance of others. And since, even with the current mainstream view, none of us knows another person’s heart, and who is saved or not or will be saved or not, we should not presume to write off anyone. When I tell other Christians how I came to the belief that God will eventually save everyone, that hell is redemptive not retributive, I start by saying I didn’t think I could believe that, because I didn’t think it’s what the Bible teaches. But it dawned on me that’s what George MacDonald was saying, and he clearly knew the Bible well, including studying the original languages, and he clearly believed that’s what the Bible taught. So I read the whole New Testament with new eyes. It seemed to me that there are many, many verses that, taken at face value, really seem to teach that all will be saved. (Such as “At the name of Jesus every knee will bow,” or “As in Adam all die, so in Christ shall all be made alive.” Look up “all” or “every” in a concordance to find more.) There are definitely some verses that need to be explained away. But those who believe in unending torment also have many verses they need to explain away. All in all, when I looked at the Biblical writings, I felt that the case for Universalism was just as strong as the case against it. (Now I think it’s stronger, but that was when I was first studying it.) At this point, I thought I should choose the belief that has the higher view of God. So that’s why I loved my pastor saying “Shouldn’t we all want it to be true?” To me, that question admits that if God could really save everyone in the end, that would be a wonderful thing, to the great glory of God. So is God not as big as we can imagine? Okay, all of that is beside the point. What does the book itself say? Now, the book is written in a conversational style. It’s not at all rigorous like Universalism, the Prevailing Doctrine of the Christian Church During Its First Five Hundred Years: With Authorities and Extracts, by John Wesley Hanson. But the author makes a strong case that the church should be making a difference in the world. “First, I believe that Jesus’s story is first and foremost about the love of God for every single one of us. It is a stunning, beautiful, expansive love, and it is for everybody, everywhere…. “There are a growing number of us who have become acutely aware that Jesus’s story has been hijacked by a number of other stories, stories Jesus isn’t interested in telling, because they have nothing to do with what he came to do. The plot has been lost, and it’s time to reclaim it. “This love compels us to question some of the dominant stories that are being told as the Jesus story. A staggering number of people have been taught that a select few Christians will spend forever in a peaceful, joyous place called heaven, while the rest of humanity spends forever in torment and punishment in hell with no chance for anything better. It’s been clearly communicated to many that this belief is a central truth of the Christian faith and to reject it is, in essence, to reject Jesus. This is misguided and toxic and ultimately subverts the contagious spread of Jesus’s message of love, peace, forgiveness, and joy that our world desperately needs to hear. “Second, I’ve written this book because the kind of faith Jesus invites us into doesn’t skirt the big questions about topics like God and Jesus and salvation and judgment and heaven and hell, but takes us deep into the heart of them…. “And then, last of all, please understand that nothing in this book hasn’t been taught, suggested, or celebrated by many before me. I haven’t come up with a radical new teaching that’s any kind of departure from what’s been said an untold number of times. That’s the beauty of the historic, orthodox Christian faith. It’s a deep, wide, diverse stream that’s been flowing for thousands of years, carrying a staggering variety of voices, perspectives, and experiences. “The good news is better than that. “Life has never been about just ‘getting in.’ It’s about thriving in God’s good world. It’s stillness, peace, and that feeling of your soul being at rest, while at the same time it’s about asking things, learning things, creating things, and sharing it all with others who are finding the same kind of joy in the same good world. “Jesus calls disciples to keep entering into this shared life of peace and joy as it transforms our hearts, until it’s the most natural way to live that we can imagine. Until it’s second nature. Until we naturally embody and practice the kind of attitudes and actions that will go on in the age to come. A discussion about how to ‘just get into heaven’ has no place in the life of a disciple of Jesus, because it’s missing the point of it all. “An entrance understanding of the gospel rarely creates good art. Or innovation. Or a number of other things. It’s a cheap view of the world, because it’s a cheap view of God. It’s a shriveled imagination…. “Witnessing, evangelizing, sharing your faith — when you realize that God has retold your story, you are free to passionately, urgently, compellingly tell the story because you’ve stepped into a whole new life and you’re moved and inspired to share it. When your God is love, and you have experienced this love in flesh and blood, here and now, then you are free from guilt and fear and the terrifying, haunting ominous voice that whispers over your shoulder, ‘You’re not doing enough.’ The voice that insists God is, in the end, a slave driver. “Have nothing to do with that God…. “Let’s be very clear, then: we do not need to be rescued from God. God is the one who rescues us from death, sin, and destruction. God is the rescuer…. “There is another dimension to the violent, demanding God, the one people need Jesus to rescue them from. We see it in the words of the older brother, when he says he ‘never even disobeyed.’ You can sense the anxiety in his defense, the paranoid awareness that he believed his father was looking over his shoulder the whole time, waiting and watching to catch him in disobedience. The violent God creates profound worry in people. Tension. Stress. This God is supposed to bring peace, that’s how the pitch goes, but in the end this God can easily produce followers who are paralyzed and catatonic, full of fear. Whatever you do, don’t step out of line or give this God any reason to be displeased, because who knows what will be unleashed. Source: This review is based on my own book, purchased via Amazon.com. The title of this book well sums up what it’s about. This is not a book for the general reader. This is a reprint of a book in the public domain, originally published in 1899. The language is dense and old-fashioned. When it first dawned on me that George MacDonald was teaching that all will (eventually) be saved, I was surprised. He clearly believed this is what the Bible teaches. But how could he think that? Doesn’t the Bible teach that the wicked will perish and burn eternally? Isn’t that what all good Christians think? So, I reread the Bible and saw how much was open to interpretation. At the time, I thought the case for either view was about equal. (Since then, I think it’s actually stronger for universalism.) I chose to believe the view that I thought had a higher view of God. If it bothers me that God would send people to burn in hell forever and ever, should I believe in that God? It also meant that I can’t write off other people nearly as easily as before. But I still thought I was bucking tradition believing this. So I was amazed and delighted to read this book, showing with many examples that the early church believed all will be saved. That the “mainstream” view was not at all mainstream until about 500 years after Christ. In fact, when the church was dominated by those who spoke Greek, it was also dominated by Universalism. Now, this book is dense, as I said. It’s only for people like me, whose biggest obstacle in believing in Universalism is thinking that it’s not Biblical, and is against the mainstream view of the church. This book shows that not only did a deeply spiritual man like George MacDonald think that Universalism is Biblical, so did Christ’s first followers. It’s for people who deeply believe in the authority of Scripture. I laughed because the book is still formidable indeed, and not at all for the average reader. But there’s excellent information here, and Christians who wonder about the Biblical basis for Universalism will have their eyes opened. This is why the book is formidable, but it’s also why it is most convincing and thorough. When my pastor talked about Love Wins, by Rob Bell, which teaches Universalism, he said that he did not agree with Rob Bell’s conclusion. But I loved that he said, “Shouldn’t we want to believe it?” In many ways this book gives me permission to believe that all will be saved. After all, if the early church fathers believed it, how can I possibly contend that it’s not Biblical? The book goes into great, convincing, and, yes, tedious detail. I’ll present a few of the points. First, he looks at the oldest creeds. There’s simply nothing about everlasting punishment. “When our Lord spoke, the doctrine of unending torment was believed by many of those who listened to his words, and they stated it in terms and employed others, entirely different, in describing the duration of punishment, from the terms afterward used by those who taught universal salvation and annihilation, and so gave to the terms in question the sense of unlimited duration. “For example, the Pharisees, according to Josephus, regarded the penalty of sin as torment without end, and they stated the doctrine in unambiguous terms. The called it eirgmos aidios (eternal imprisonment) and timorion adialeipton (endless torment), while our Lord called the punishment of sin aionion kolasin (age-long chastisement). “Not a writer among those who describe the heresies of the first three hundred years intimates that Universalism was then a heresy, though it was believed by many, if not by a majority, and certainly by the greatest of the fathers. Atheneum Books for Young Readers, New York, 2010. 113 pages. Last September, at the National Book Festival, I got to hear Judith Viorst read from this book, and I was eager to get my hands on it from that moment on. This is definitely a book that begs to be read aloud. The biggest catch is that it’s really too long for preschool story time. Still, I think any elementary school teacher or librarian could have an entire classroom eating out of the palm of their hand by reading this book. “OKAY! All right! You don’t have to tell me! I know! Okay, I went on past the first page. But since this is my review, and I’m the one writing it, I can do what I want. Oops. The style’s rubbing off on me. Well, Lulu decides she wants a brontosaurus for a birthday present. Her parents, who are used to indulging her every whim, are stymied as to how to comply. They end up actually telling Lulu “No.” Lulu, predictably, throws a fit. A bronto-bronto-bronto Brontosaurus for a pet. She encounters various dangerous creatures, and gets the better of all of them with her pugnacious ingenuity — until at last she meets a brontosaurus. And when she meets the brontosaurus, whom she calls Mr. B, there is a lovely reversal that teaches Lulu a nice lesson. Just to keep things interesting (as if they weren’t already! ), the author gives us a choice of three endings, so the reader can decide for themselves how happily to let things end. And did I mention the perfect illustrations on almost every set of pages? As I look through this book again, I notice that besides being a phenomenal read-aloud, it’s also a true stand-out in the elusive category of chapter books for beginning readers. The chapters are extremely short — usually only a couple pages; there are lots of pictures; but the story is completely delightful and absorbing. Definitely a non-threatening and highly enjoyable reading experience. TOR Fantasy, New York, 2001. 590 pages. I very greatly enjoyed Juliet Marillier’s young adult books, Wildwood Dancing and Cybele’s Secret, but these books about the ancient Irish tuath of Sevenwaters have me completely enthralled. Son of the Shadows takes up the tale with Fiadan, the daughter of Sorcha, the heroine of Daughter of the Forest. Fiadan and her twin brother Sean are sixteen, and the people of Sevenwaters are feeling uneasy. It seems an old evil is awakening, and they aren’t sure how it will break out. Sean is training to be the next chief of Sevenwaters, after their uncle Liam. The family still wants to win back their sacred islands from the British family of Northwoods. Sean thinks there is no point in waiting for the prophecy to come true. Fiadan, like her mother, is a healer, and she’s blessed, or cursed, with The Sight. But Fiadan doesn’t quite fit into the pattern that the Fair Folk seem to be manipulating. In Daughter of the Forest, the Fair Folk did a lot of directing in the background. In this book, Fiadan doesn’t like the requests and commands the Fair Folk give her, and she makes her own choices. But will it mean disaster for her family? After I read this book, I decided that this series is too good — I am going to order my own copy of the next book, and a copy of this book while I am at it. I know I will want to reread them. Fiadan feels like a precious friend. I want her to succeed! I want to find out what happens to her family next. As for me, I found no better therapy when recovering from a stroke than to read this tale of love and adventure and danger and treachery and loyalty and courage. Houghton Books for Children, Boston, 2010. 48 pages. 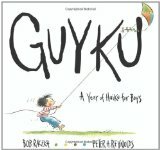 At the end of this book, Bob Raczka explains why he wrote Guyku, a collection of haiku for boys. “Now that I’m a grownup (sort of), I realize that haiku is a wonderful form of poetry for guys like us. Why? Because haiku is an observation of nature, and nature is a place where guys love to be…. “One more thing about haiku: they’re written in the present tense. In other words, whatever happens in a haiku, it’s happening right now. From my experience, guys are always interested in what’s happening right now. The poems are wonderful, with a section for each of the four seasons. The illustrations beautifully capture the playful, adventurous spirit expressed in the haiku. I’ll give an example from each season, but please remember that the illustrations make them all the more wonderful! we turn rocks into a dam. Check this book out and share it with a guy in your life! You are currently browsing the Sonderbooks blog archives for November, 2011.